The house that Kem Studio designed for Sarah Magill on a narrow lot in Kansas City has a steel facade with reclaimed cypress cladding near the entrance. The entire structure sits atop a steel foundation set on concrete piers that were driven into solid stone. Inside the front door, coats hang from aluminum Bjärnum hooks by Ikea above a vintage Lane coffee table, which Magill bought from a coworker, and beneath a photograph by Beth Mercer. 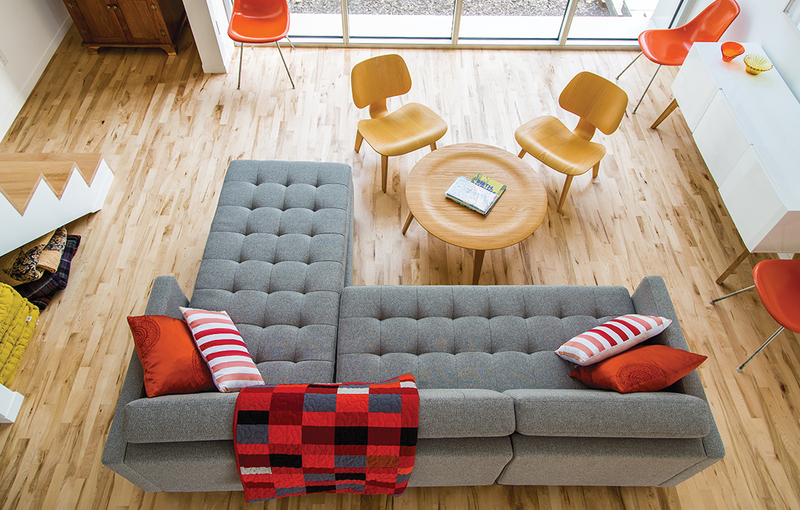 The loft is furnished with a Tillary sofa from West Elm and a wire-base Elliptical table by Charles and Ray Eames. A Dual Pebble tufted sectional sofa by Gus Design Group for CB2 is the focal point of the living space. The maple floors are composed of inexpensive “shorts” left over from other projects and sold at a discount. The staircase features a minimalist design with maple treads and edges. The alcove beneath the stairs allows Magill to stash things where they can still be easily accessed. The metal shelving system is another coworker castoff. Magill furnished the living area with an Eames coffee table and molded plywood chairs that she bought from a neighbor. The Eames fiberglass chairs were eBay purchases, and the Alba credenza is from CB2. The lithograph is by St. Louis artist Sage Dawson. 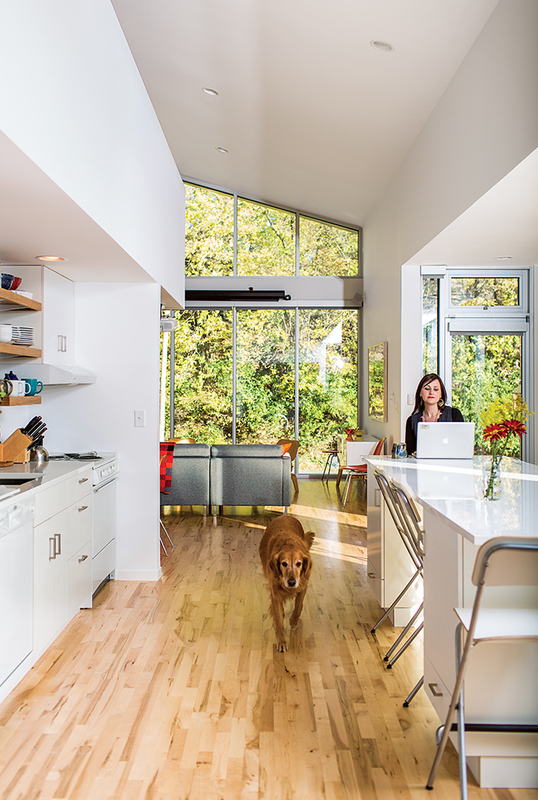 Sarah Magill and Copa, her golden retriever, relax in the kitchen of her home in Kansas City, where an eco-quartz-topped island can be used as a dining table­—one of the home’s many adaptable features. The Akurum cabinets and handles are from Ikea, as are the Franklin folding bar stools, and the appliances are compact models from Summit. C & G Construction made the kitchen shelving from reclaimed cypress not used in the siding and decking. The White Cliff countertops are from Cambria, and the faucet is from Ikea. A pair of Ikea Expedit shelving units line one wall of the sleeping area. The sleeping space is set off with curtains instead of a door to foster an open feel on the ground floor. Bedding from West Elm and a quilt made by Magill’s mother sit atop a platform bed, also from West Elm. The red chairs, originally from Ikea, were another inexpensive secondhand acquisition. The deck chairs feature reversible canvas slings by the fashion designer Julie Brown. Most people who build a house have a grand list of things the place has to have. Sarah Magill’s went like this: “I wanted to be able to run on a treadmill, I wanted to watch movies, and I wanted to be surrounded by apple trees,” she says, standing in the house that emerged from those modest requests—a luminous angled box, perched on a ridge at the western edge of Kansas City. Affordability and sustainability rounded out her list. For the designers, Magill’s limited wish list meant there was ample room to get creative. “It was really refreshing working with someone who was that open, who didn’t have preconceived notions about what a house should be,” Satterwhite says. “It was more about volume and light than it was about square footage and number of rooms.” Still, the bigger goals—sustainability, flexibility, and affordability—needed to be wrapped in a small footprint. Magill’s original target budget was $185,000 for an 800-square-foot, one-bedroom, one-bathroom structure. That grew to 1,250 square feet with the addition of a loft, coming in around $235,000. Given the numbers, the Kem team designed spaces to pull double duty. “How could we take one thing and let it do two or three things?” Satterwhite says. In the kitchen, an eco-quartz-topped island doubles as a dining table. A deck off Magill’s bedroom, at the back of the house, extends the living space outdoors. Eventually, Magill plans to install a Murphy bed, expanding the living area even more. The loft, which serves as a second bedroom, morphs into a balcony for viewing shows, movies, and live music—Magill sometimes invites musicians and bands over to play—in the space below. The living room fulfills two of Magill’s needs, becoming a gym of sorts when she rolls her treadmill from an oversize closet, and transforming into a cinema when she pulls a projection screen over the window facing the street. 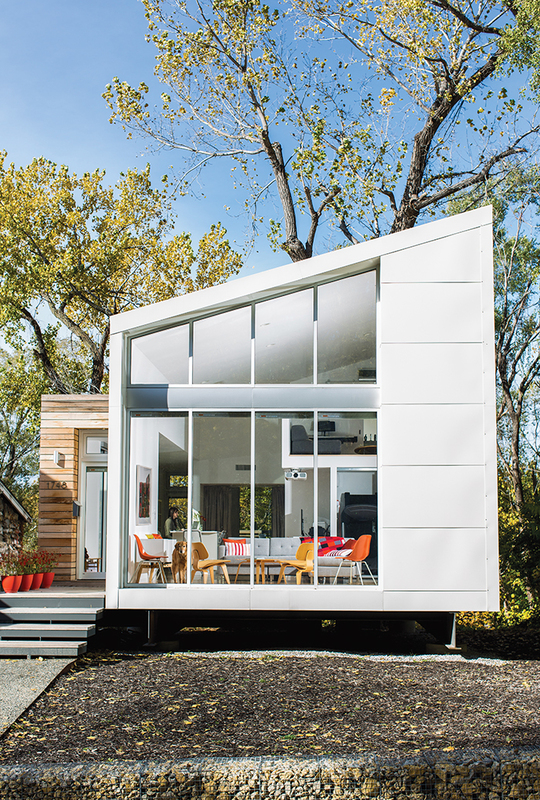 Kemnitzer and Satterwhite, along with Ryan Gale of C & G Construction, kept materials simple. The frame is standard wood; with studs every 24 inches rather than the typical 16 inches, it economizes on timber. The exterior is reclaimed cypress and steel, an inexpensive cladding that references Magill’s farm roots. “This was a project where you’re using basic things, but you’re using them in new and unique ways,” Kemnitzer says. Some of those exterior finishes made their way inside. In the kitchen, for example, cypress shelves line the wall, adding volume to an otherwise flat area. Magill also saved on appliances. “My specialty is popcorn,” she says. “You don’t need a nice gas stove to cook popcorn for your friends.” The kitchen cabinets are from Ikea, as are the bathroom fixtures—maybe not the “greenest” choices, Magill acknowledges, but affordable. The maple floors are composed of “shorts”—pieces discarded by people who don’t care for eccentric patterns of oddball wood.